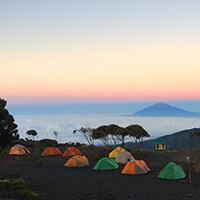 The Machame route is the most popular and therefore also one of the busiest routes on Mt. Kilimanjaro. 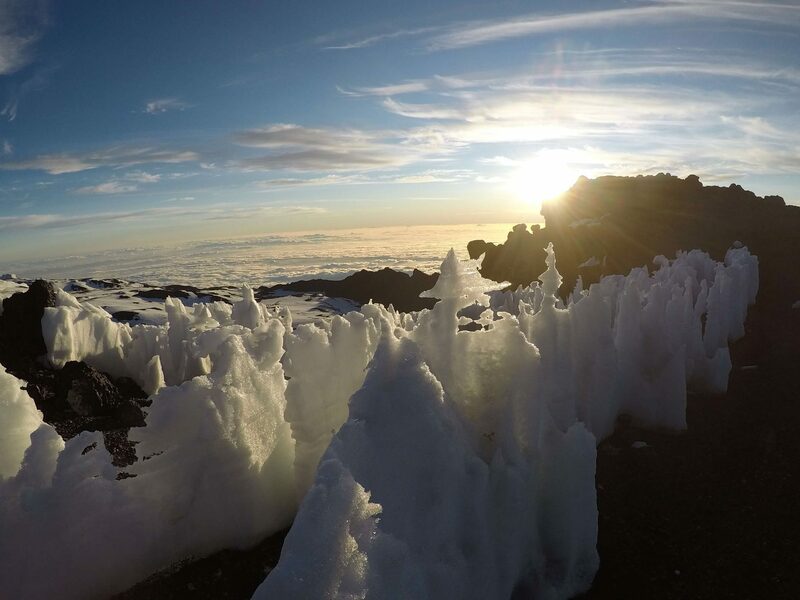 Due to the ascent and descent over its duration – following the golden rule of ‘climb high and sleep low’ – the Machame Route offers some of the best acclimatization and the greatest summit success. 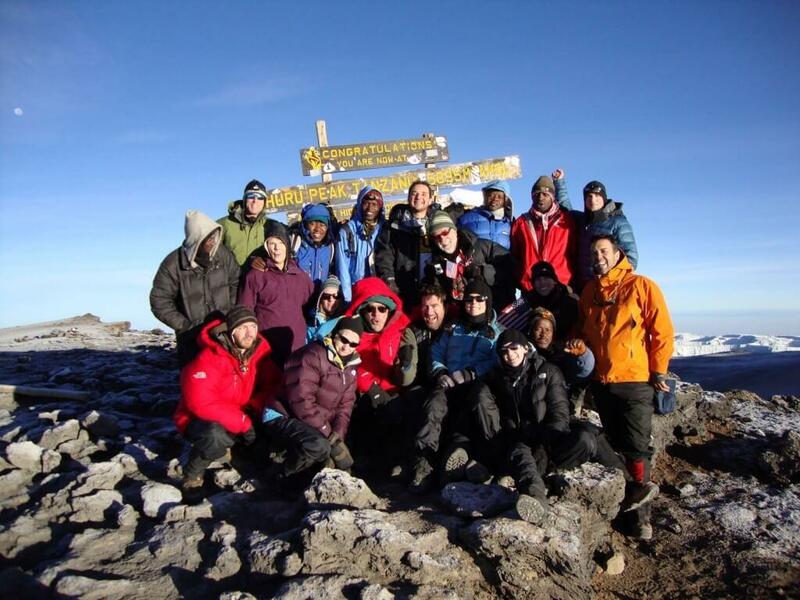 The Machame Route is definitely recommended for people experiencing high altitude mountaineering for the first time. It takes you in some of the best geological features on the mountain. Descent is via Mweka Route. A minimum of 6 days is needed, but for more comfort and to increase your chance of success, 7 days are recommended. 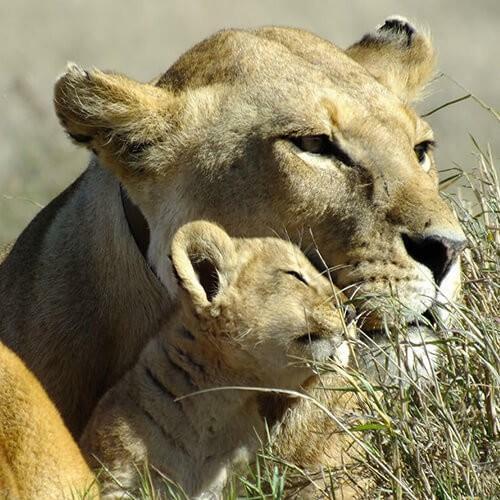 Upon your arrival at Kilimanjaro Airport you will be greeted by one of our team and then driven to your lodge in Arusha where you can freshen up and relax into Tanzania. After breakfast in your hotel you will be given an overall briefing from your guide. At 9am you will be met by the rest of our guides and porters. Following a final cross-check of equipment and supplies, our staff will drive you to the Machame Gate. Anything you do not want to take with you on the mountain can be left at a lock up in the hotel. Once at the gate you will be given a packed lunch and after registration with the Kilimanjaro Park office your climb will begin with ascending into the rainforest. During the day at about half way up we will have a break and you can enjoy your packed lunch. 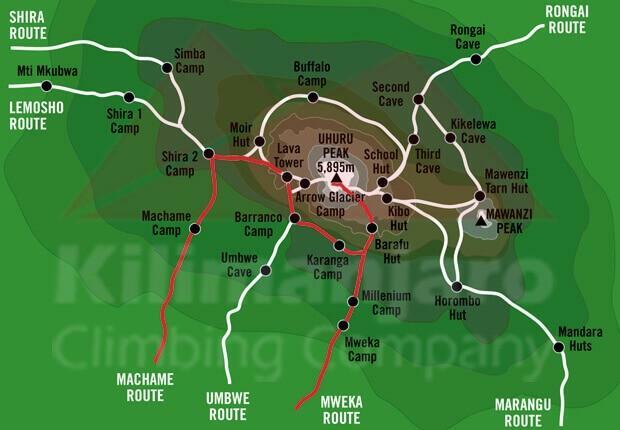 We will reach the Machame Camp in late afternoon. 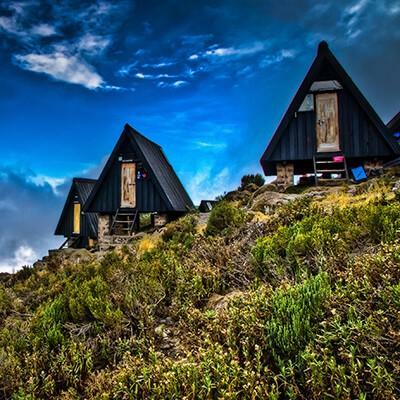 After your arrival and registration at Machame Camp you will be taken to your camp and tent which has already been set up by the porters who ran ahead, where you will greeted with boiled drinking water and hot washing water. Once you have freshened up and settled in, a hot dinner will be served in the mess-tent. You will be woken up after your first night on the mountain with a nice cup of coffee, tea or hot chocolate at 6:30am in your tent. After breakfast we leave the rainforest and continue our ascent crossing a small valley into open moorlands where the vegetation is sparse with small shrubs and up to a steep rocky ridge. After a short break, our route turns onto a river gorge and up to Shira Plateau where you will catch your first glimpse of the Western Breach and its stunning glaciers. Continuing on to Shira Camp, where the cook will welcome you with boiled drinking water and hot washing water. After a hot lunch, there is plenty of time to explore the Shira Caves or just relax and rest until being served your hot dinner. Due to the camp being very exposed it can get very cold and sometimes windy. We pack up and leave Shira camp for a 4-5 hour trek to the well-known landmark of Lava Tower (4.600m) for acclimatization. Once reaching Lava Tower we will have a short break for lunch for some bonus acclimatization before starting a 2 hour descent by 650m to Barranco Camp, following the golden rule of acclimatization 'climb high and sleep low'. This will be our toughest day so far but the climb offers multiple terrific opportunities for photos. As we descend through the valley, the amazing sight of the Giant Groundsels is bound to stop you in your tracks. Barranco Camp gives you a beautiful view of the Western Breach and Breach Wall and be prepared with your camera while you are waiting for dinner for what could be one of the most spectacular sunsets you have ever seen as the sun drops down into the valley. Today the climb has a technical challenge! We start to climb Baranca wall – also known by its nickname 'breakfast wall', meaning after climbing this wall your breakfast has been burned away. Don't worry, it is much easier than it looks and the view down to Moshi is fantastic. After crossing Karanga Valley we arrive at our camp for the night. Once again you will be welcomed with boiled washing water and some snacks, followed by a hot lunch. This is the last place for the porters to collect water for the rest of the ascent. While they are doing that you will have the option to talk a short hike to help with acclimatization and then relax into the evening with a lovely hot dinner. Today we complete the 'Southern Circuit' and make our ascent to Barafu Hut and enjoy again a spectacular view of the summit. We will arrive at the camp very early and you will get served a hot lunch. In the afternoon our guides will give you a final briefing. It is also a good time to cross check and prepare your equipment and clothing. Dinner will be served very early to give you ample time to rest and sleep. The wake-up tea will be served at 11:30pm with the departure at midnight. After a hot drink and some biscuits we will start the challenge for the summit. Our initial 6 hour climb begins in the dark with only our headlamps and guides to show us the way through the thick scree and winding pathways of Ratzel and Rebmann Glaciers until we reach Stella Point. Many say this is the most challenging part of the entire climb but you will be rewarded with what is perhaps the most emotional and beautiful sunrise you have seen or ever will see in your life. 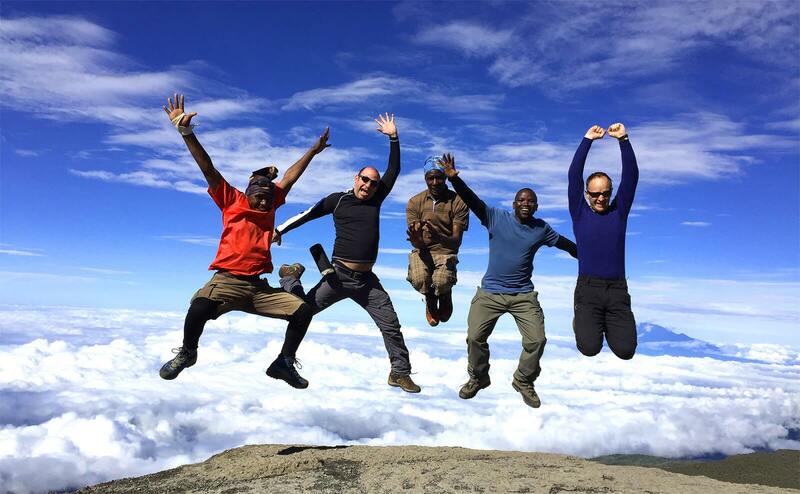 After taking some pictures at the sign, and a short rest we will join the last part of the Marangu route to continue 1–2 more hours to reach your ultimate goal – the summit – the highest peak of Africa – Uhuru Peak at 5.985m. Congratulations!! You are now standing on the 'Roof of Africa'. Our guides will take pictures of you at the world famous Uhuru sign and post it on Facebook for your family and friends at home. 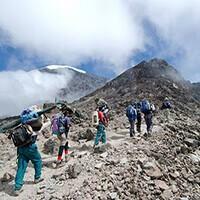 We will descend through sliding scree and winding pathways for about 3 hours back to Barafu Camp. On reaching the camp you will have the chance for a longer break before we start the next descent to Mweka Camp. Trekking poles are very useful in this part of the descent. In the camp you will have a last fantastic view on the summit – finding it hard to believe that only a few hours ago you were stood at the top. And after this long day, you can enjoy your dinner and your last day on the mountain. Expedition food to include a hot breakfast,packed lunch, a hot evening meal and snack food available at camp + hot drinks.